I made these more than a month ago and have been waiting to post them to try and keep the secret, but I can wait no longer. I’m finally getting the appeal of the mini quilt and mug rug phenomena. When I was an art student in college my mother would come to visit and look at the giant 4′ or 5′ square paintings I was working on and beg me to paint smaller. She saw my grocery or power bill money flying out the window on huge quantities of paint. I would be aghast at the idea of trying to contain my artistic expression in the prison of a small canvas or something, I’m pretty sure I was insufferable about it. But it was inconceivable to me to think smaller. It still is, any time I think about a new project it tends to be full scale. This is definitely true of my quilting. 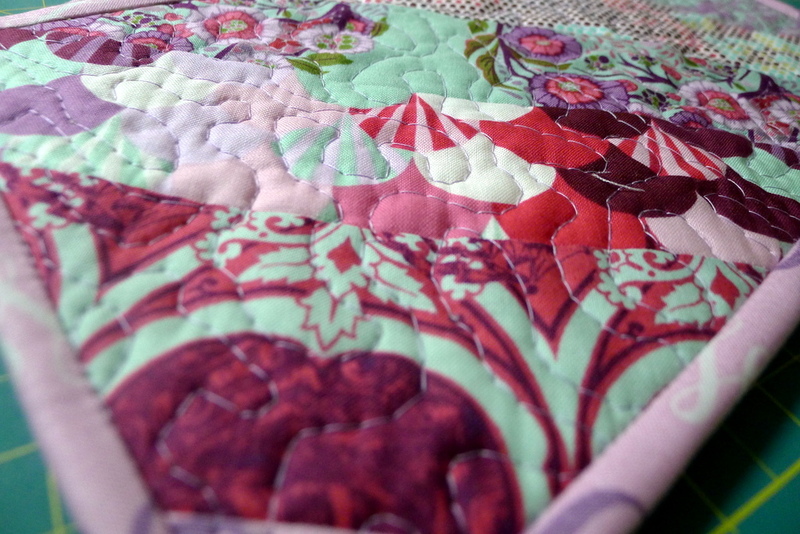 So I never understood the point of small scale quilts. I tried one once for a contest, but it didn’t really take. 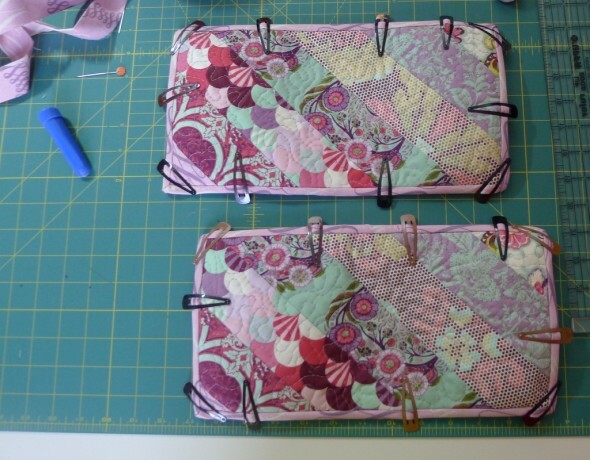 It’s also why I struggled with quilting bees. I need to get excited about the whole big picture to even think about making a block. But I have to say, Laura Ann’s mug rugs were kind of addictive. Then Kathy saw them and wanted some, too. Truth be told, since I’d bought her a French press for Christmas I was already pondering a pair of them for her February birthday. But I was not on the ball about winter birthdays this year with the arrival of The Sprout. So I just made her a pair over the weekend. And. I. Love. Them. 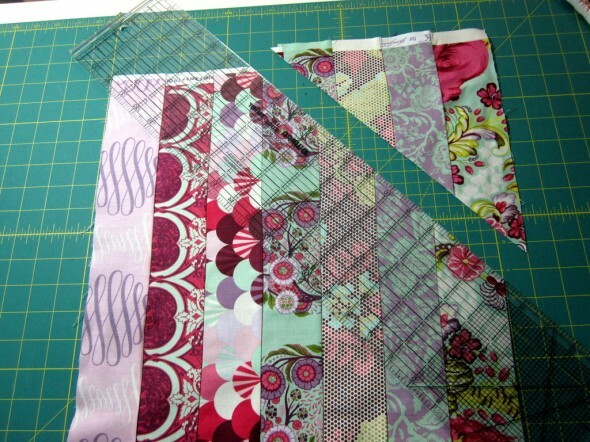 They’re so quick to make that it’s a great opportunity to practice quilting skills. Like binding, which is my Achilles’ heel. And patience, the biggest skill. Usually by the time I hit the quilting phase of a project I get lazy and don’t take enough care with my thread color choices or my corners. I mean, during the piecing phase I get lazy about my seams, too. And during the cutting phase…you get the idea. The bigger the scale, the more I fall down on the job as it drags on. I like things big, but I also like things quick! And these provide some much needed practice. 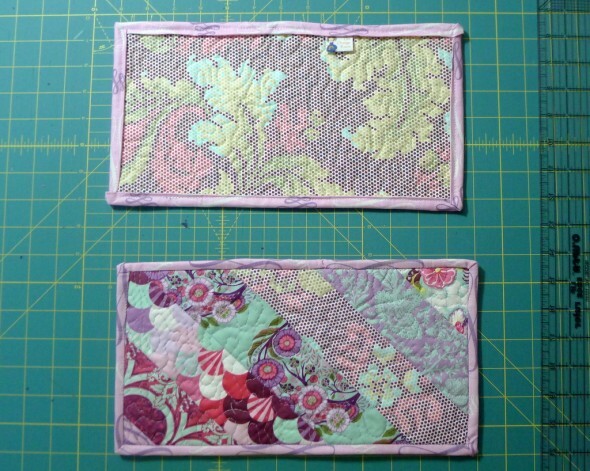 My corners and binding are still terrible, but I learned a few things while making these. I thought this was the proper occasion to finally dig into my stash of Tula Pink’s Parisville, which I’ve been saving for a rainy day. And Kathy loves purple, so it was a no brainer. I decided to do simple, slick diagonal stripes. 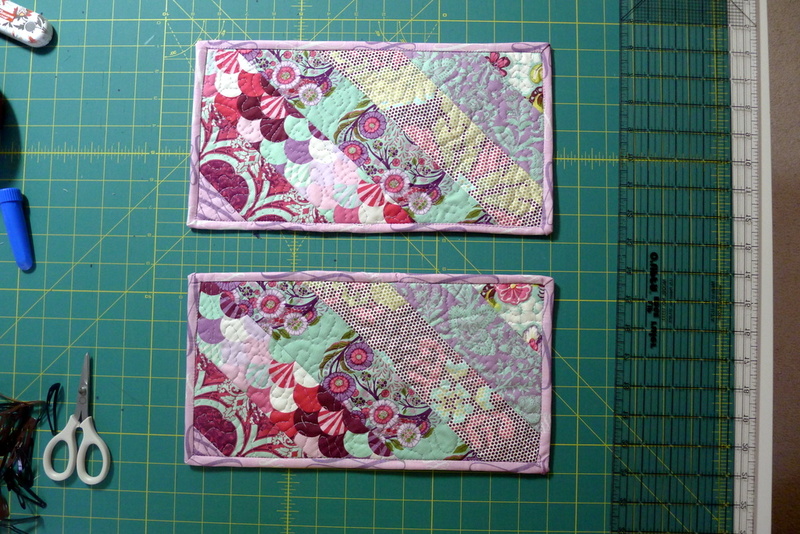 So I cut 2.5″ strips out of the 7 fabrics I have from this collection. I sewed them all together and then cut out roughly 13.5″ x 7.5″ rectangles on the diagonal. 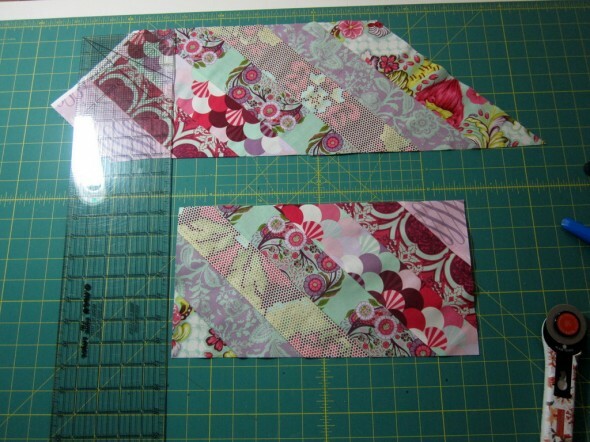 Really easy, and I have some scraps leftover that I *think* will be going into Kathy’s Christmas present. Which I’ve already worked out in my head, inspired by this project and some recent book purchases. 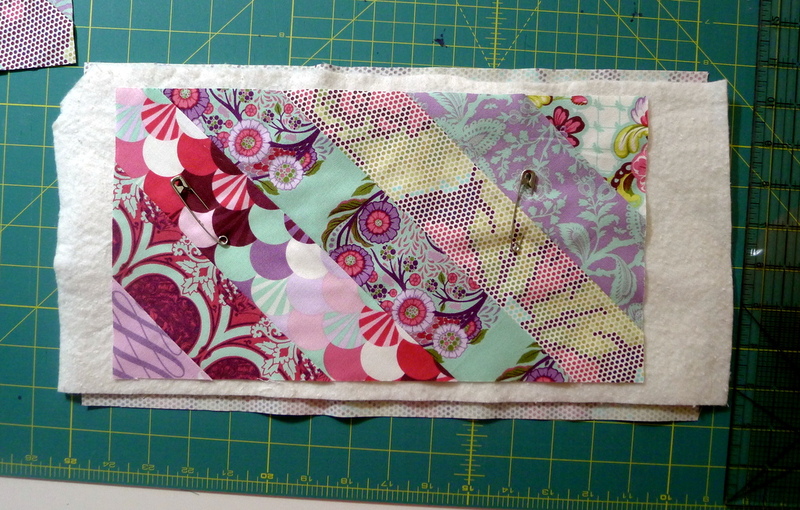 and went to town with my all-time favorite, free motion quilting. Then I made the binding out of 2.25″ strips and attached it. I’m still terrible at mitered corners, but I did one perfectly! I almost did a cartwheel, until I realized it was a fluke and I have no idea what I did differently there. Oy. And voila! There they are! Valentine Project Pt. 3: All Finished! Yes, you were insufferable about it. 🙁 I didn’t think you knew how frustrating it was for your Mom.